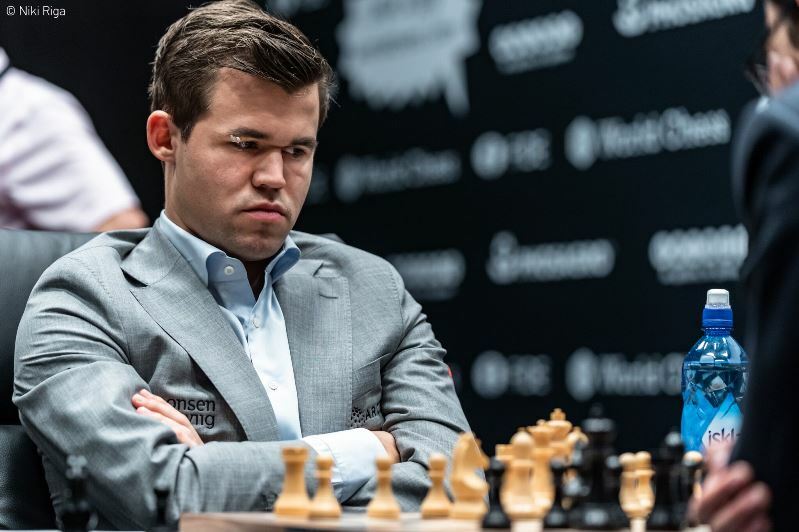 “He’s been very well-prepared and I haven’t gotten much with White – those are the cold, hard facts,” reflected Magnus Carlsen after a draw in which he failed to make any impact on Fabiano Caruana. Magnus allowed the Nd7-f6 Petroff that had infamously been leaked as Fabi’s intention in a video earlier in the match, but was either surprised almost immediately or hesitated at the board to challenge his opponent in the sharpest lines. He chose a safe option and it will all now come down to Monday’s final 12th classical game, where Fabiano has the white pieces. 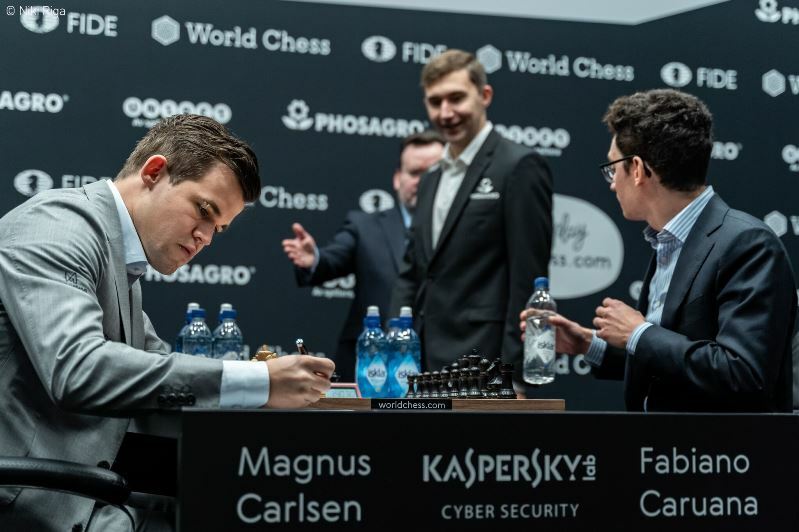 Evgeny said Game 10 had been, “one of the best games in World Championship history,” and felt that, “maybe Magnus would try something more risky today,” so as not to go into the last game as Black with the scores still level. Alas, if that was ever the intention, it certainly wasn’t what happened. For the best possible summary of Game 11 check out Peter Svidler’s recap below – you definitely don’t want to miss the first 30 seconds! I think for a person who, you know, sort of screams at every corner that, “I want to be World Champion,” this is extremely humiliating. Instead we got 1.e4, to complete a sequence of Magnus cycling twice through his first moves in his white games: 1.d4, 1.c4, 1.e4, 1.d4, 1.c4, 1.e4. 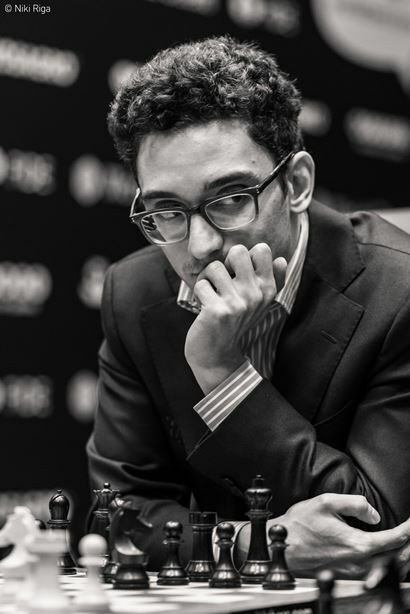 Our commentators, who have often struggled to fathom what the World Champion is aiming for with White, at least felt this was a clever approach – giving his team a whole week between each use of a move in which to prepare something against Fabiano’s response. He managed to surprise me nevertheless. If that was indeed some kind of gambit, it worked well. If Fabiano takes on f5 he loses immediately (55…Bxf5?? 56.h5! and the pawn queens or the bishop is lost), but he doesn’t have to take, and after 55…Bc2! a draw was agreed. If White ever takes on g6 Black will recapture with the pawn and there’s no way to make progress. Sometimes you get asked this question if you would take a situation like this, but the truth is I wouldn’t, because I want to enjoy the process of it, and I would feel kind of bad missing the first 11 games of the match. It’s a normal situation, it’s not a bad one at all, but I also wouldn’t accept any sort of offer before the match. I’m not thrilled, obviously. I got surprised in the opening and then just decided to shut it down. I just wanted to play it safe… I thought in this match situation there was no reason to go crazy. Grischuk: Normally a draw should be a big favourite, but I feel like the whole universe will be fighting against it. Giri (somewhat later): But Alexander, don't you think if the universe wanted 12 draws not to happen the universe would have intervened by now? Svidler (a little later again): I will allow one joke of that kind today, and that will be [user] MrDodgy saying, "if the universe wanted 12 draws then Anish would have won the Candidates!" On that note, all that’s left to do is wait and see what happens on Monday. Will it be a thriller like in Game 10, the damp squib we got in New York, or something in between? Whatever happens, it’s going to be a very big week in chess! First though, we have an extra rest day, and this time Peter Svidler will be playing Banter Blitz together with Sopiko Guramishvili – catch the show from 16:00 CET!